“This weekend, some 40 Scouts from Ελληνικός Προσκοπισμός were on their second mission to the island of Lesbos where they once again joined local Scouts and volunteers from other civil society organisations engaged in refugee support activities. 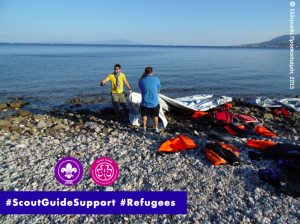 A group of Scouts spent the two days on the beaches and collected waste and items no longer needed and left behind by refugees arriving on the island, like broken rubber dinghies, inflatable tires or life vests of all shapes and sizes. This activity was made possible thanks to support received from the World Scout Foundation. If you are involved in a similar refugee support activity, let us know and we will share it, too!